"Legend Blue" or "Ultimate Gift of Flight" Air Jordan 11s? Macklemore already has both of this season's holiday Air Jordan 11 releases. Many of sneakerheads will be forced to choose over the "Legend Blue" Jordan 11 and the "Ultimate Gift of Flight" pair this season. This one doesn't have to choose, he's a member of the Jordan Brand family and he gets sent free sneakers. 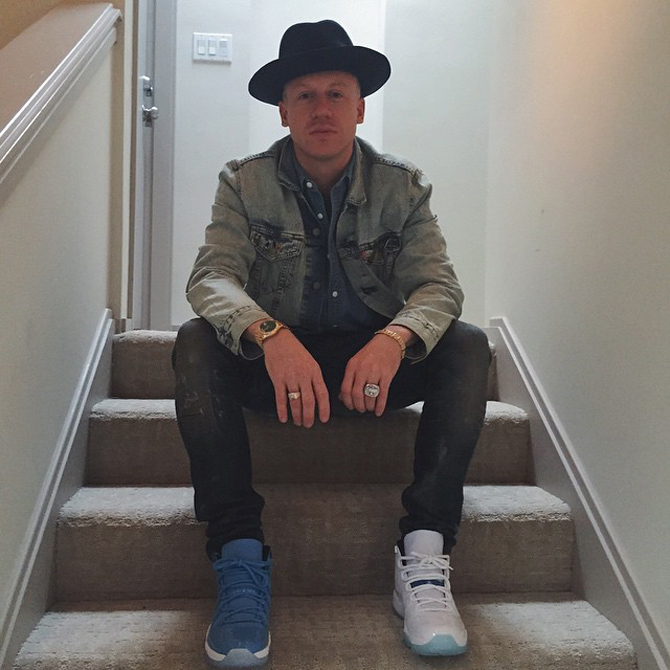 Seattle-based rapper Macklemore is shown here wearing both of the Jordan 11s that are set to release this month (it's a safe assumption that he's also got the XX9 pair that comes as part of the "Ultimate Gift of Flight" pack). The main divide between the groups going after these shoes is one most should be a familiar with - the traditionalists vs those who are down with new colorways. Both Air Jordan 11s in question will releasing in the coming weeks.